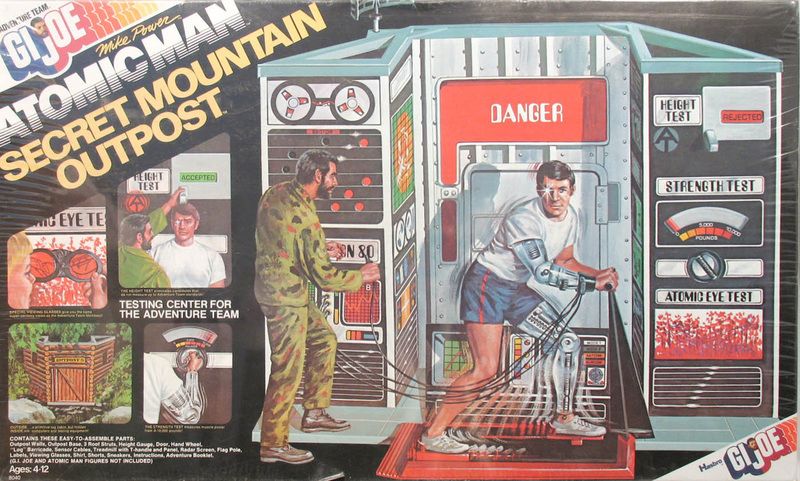 The Secret Mountain Outpost (8040) is framed by the included comic book as the Adventure Team's top secret induction center. Disguised as a simple mountain cabin on the outside, inside one finds all manner of high tech gadgetry used to test prospective members of the Adventure Team. Also included is a treadmill and electronic bracelet to test applicant's speed. Anyone who remembers the opening credits of The Six Million Dollar Man will recognize Hasbro's intended mimicry. The computer on the wall is labelled "Maxitron 80" on most sets, but a limited number of early sets call it "Bionivac," a name that was changed when Hasbro was warned off anything that smacked of the trademarked word 'bionic.' If you can share an image of the 'Bionivac' version of the set, please contact me! The set also included the line's only set of sneakers, along with a white tee shirt and blue shorts with red stripes. Mike Power dresses right to work out. Spoiler alert: Mike passes the induction tests and makes the Adventure Team with record scores. Above, the set's uniform featuring the Adventure team's only pair of sneakers. Below, the parts list. 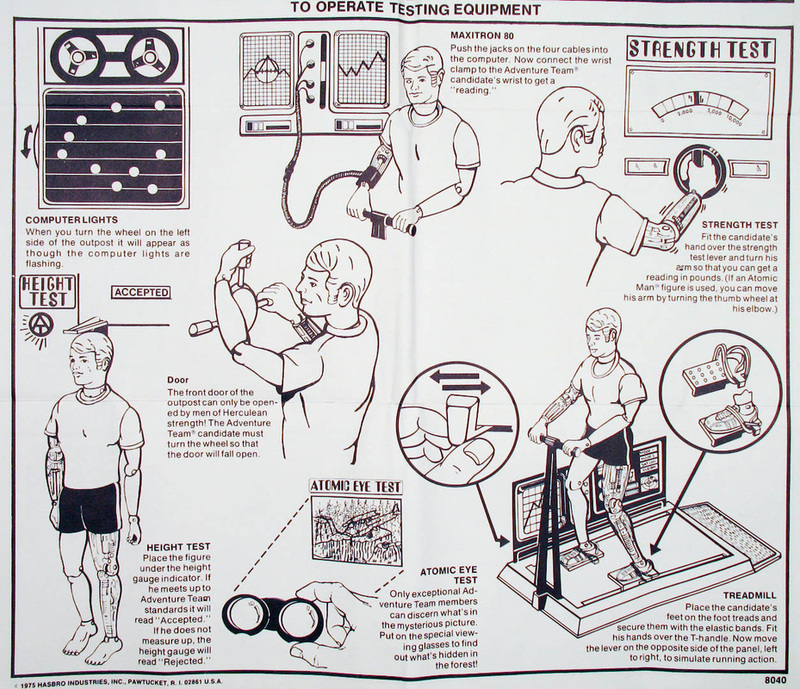 Above, instructions on how to use all the high tech testing gear. Top right, the kid-sized glasses to use the Atomic eye effect created by affixing a red image on clear backing (bottom right) over the picture of a crashed plane printed in blue on the outpost wall. The red lenses cancel out the trees leaving the viewer with the image of the plane. Below, the comic included in the set.